Fishing is a favorite pastime of both Florida residents and visitors. 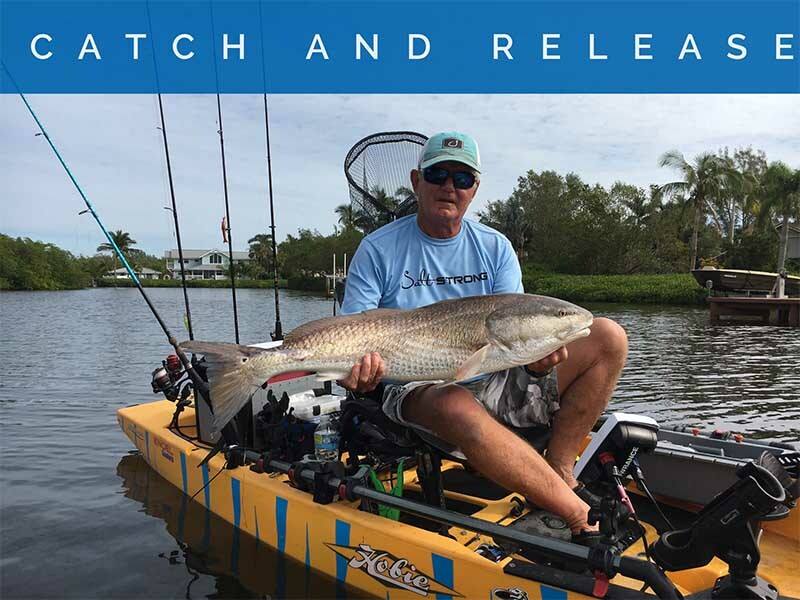 Fishing efforts in Florida have increased dramatically over the past decade, making it more important than ever to practice effective catch-and-release techniques to reduce fishing impacts. The majority of fishing trips in Florida result in some fish being caught and then released. Regulated species, such as red drum, are released if they are outside the slot limit, either too small or too large. Tarpon and bonefish are examples of fisheries that are strictly catch-and-release only. Some anglers even fish with the intention of releasing everything they catch. Fish are released for a variety of reasons and increasing a fish’s chance of survival after it is released will help ensure that fish populations remain sustainable for future generations. Use tackle heavy enough to bring the fish in quickly. Using tackle that is too light exhausts the fish and depletes its energy reserves, which can put the fish at risk of death by predation and physiological stress. Use non-offset circle hooks to reduce the chance of gut-hooking a fish. Circle hooks are designed to catch in the corner of a fish’s mouth, reduce internal harm, decrease dehooking time and increase the likelihood of hook removal. Avoid using multi-hook rigs or lures. If you do use them, remove one or two of the hooks. When using treble hooks, remove one of more of the points and flatten the remaining barbs. Using barbless hooks, or hooks with a flattened barb, is one of the most important things an angler can do to minimize internal damage to the fish and make release quicker and easier. If a hook cannot be removed, cut the line as close to the hook as possible. Use non-stainless-steel hooks, as they will rust and deteriorate out of the fish over time. Dehooking tools allow the hook to be secured and the barb shielded without re-engaging when the hook is removed from a fish. These tools come in a variety of shapes and sizes; even a pair of needle nose pliers is considered a dehooking tool. Keep these tools in a convenient place so fish may be released quickly. If a fish swallows the hook, it is better to cut the line as close as possible to the hook instead of trying to remove it. Leave fish in the water during release and when taking photos, if possible. If a fish must be removed from the water, use wet hands to reduce the amount of protective slime removed from the fish. The slime protects the fish from infection and aids in movement. A knotless, rubber-coated landing net is ideal when handling a fish since it supports the fish’s body weight and protects the fish’s slime layer. A landing tool that grips the jaw can also be used to help control fish. If you want to take a picture of your catch, hold the fish horizontally and support its weight with both hands to decrease internal damage. Always avoid lifting a fish by the gills, eyes or tail if it is to be released. Only gaff a fish when you intend to keep it. In general, handle the fish as little as possible and release it as quickly as possible. If the fish doesn’t immediately swim away and is lethargic or erratic, some resuscitation may be needed. Revive exhausted but otherwise healthy fish by first placing the fish in the water, one hand under the belly and the other hand holding the bottom lip or tail. If the vessel is anchored, point the fish head-first into the current to gently force water through the mouth and over the gills. If the vessel is not anchored or there isn’t a current, hold the fish in the water alongside the boat and gently nudge the boat into gear, forcing water through the gills of the fish. If you are fishing from a non-motorized vessel such as a kayak, place the fish in the water, hold its front lip (use a gripping tool if the fish has teeth) and move the fish in a “figure-eight” motion. Never move fish backward in the water, since water will not flow properly through the gills. To learn more about proper fish handling methods, visit MyFWC.com/Fishing.